ON TWE RADIO MAR. 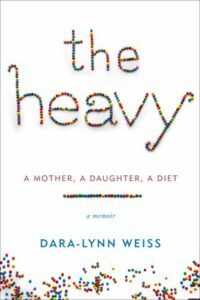 23, 24–In her new book, The Heavy: A Mother, A Daughter, A Diet–A Memoir (@RandomHouse), Dara-Lynn Weiss describes putting her six-year-old daughter, Bea, on a diet when a doctor pronounces her obese. She chronicles the struggle to get her healthy again as she deals with her own body and health issues. Dara-Lynn first wrote about her daughter’s plight in Vogue and was dubbed “diet mom” and villified. In this book and on TWE Radio, she responds to her critics and tackles childhood obesity head on. The book is controversial and takes on parenting methods, discipline, and dealing with kid’s self-esteem. Her unflinching approach is refreshing and provides a good source of information about raising children with eating disorders.